Beach style isn’t just a closet kind of thing- it extends to all over the home- especially in the South Bay. No matter how colorful or cute, “This way to the beach,” wall hangings can sometimes seem a little chintzy, which is why I love Cat Studio embroidered pillows and other items from downtown Hermosa Beach shops. The colorful fun-loving couch accessories add a coastline statement that literally says California. The beautiful hand-embroidered pillows feature the name and landmarks of all 50 states- not just our beautiful sunny state. The California pillow, like all the other 49 pillows, features bright colors and fun embroidered symbols that represent each state. The California pillow ($152) showcases the sunny west coast state with surfers, sea lions and the San Francisco Bridge. 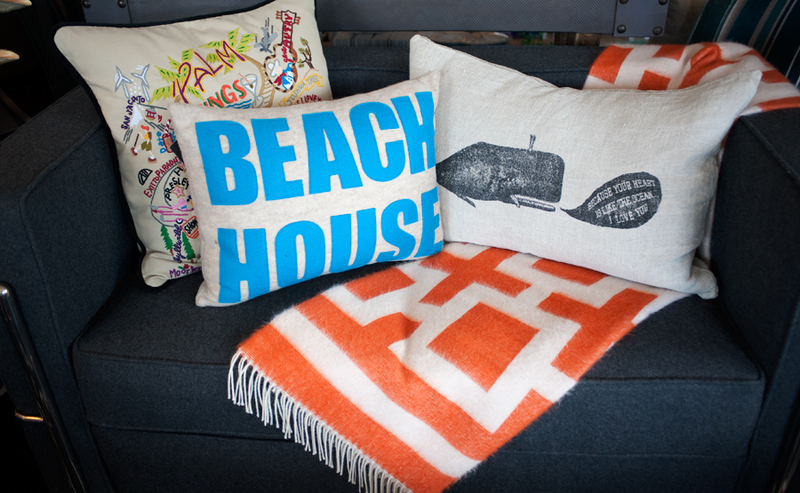 Shryne Design, a beautiful beach design themed shop owned by South Bay-based designer Shanna Shryne located at 910 Hermosa Avenue carries the squishy style ($162) along with other beach-themed pillows. Shryne loves printed pillows made from recycled plastic soda bottles from designer Alexandra Ferguson. They say things like “The Good Life,” or “It Wasn’t Me” ($99). Shryne Design also has pillows from Sugarboo Designs– a family-run pillow and mercantile company that is inspired by nature and children’s art.